And so the abolishment of hangar begins! I have been making the same thing for breakfast for a very long time. I love it and it’s easy. I love breakfast. I love oatmeal. I love peanut butter (pb). 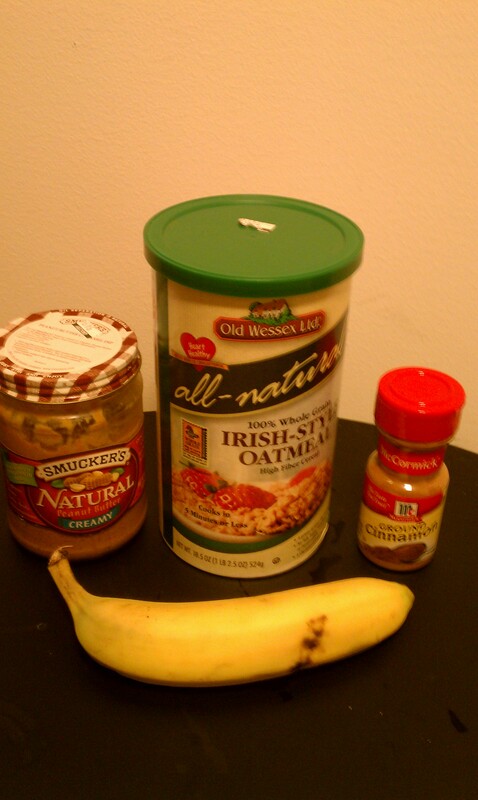 Bananas are okay, but mainly they are rockin’ with oats and pb. The portion controlled combo is delish. Here is a quick and easy suggestion for a yummy breakfast for you. Here are your ingredients. 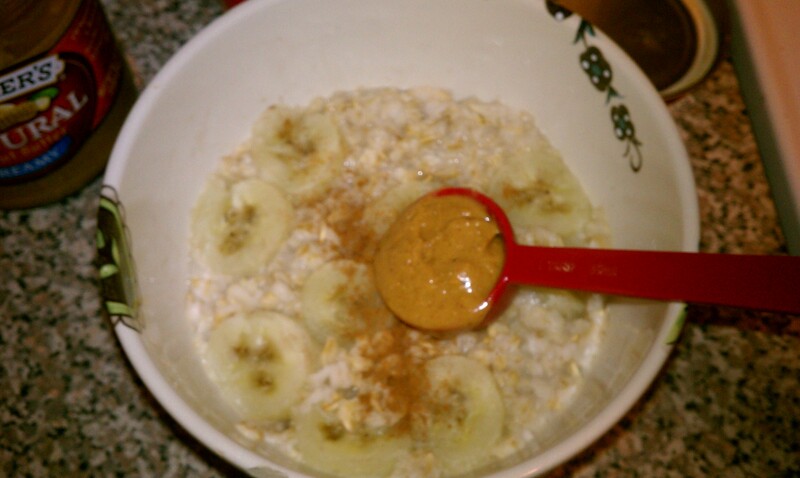 You’ve got your oatmeal, natural pb, cinnamon, and a banana. I used Irish-Style oats, but you don’t have to. Don’t use the instant crap. Go for the old fashioned oats. I like me some Irish-Style because it’s chewy-er. 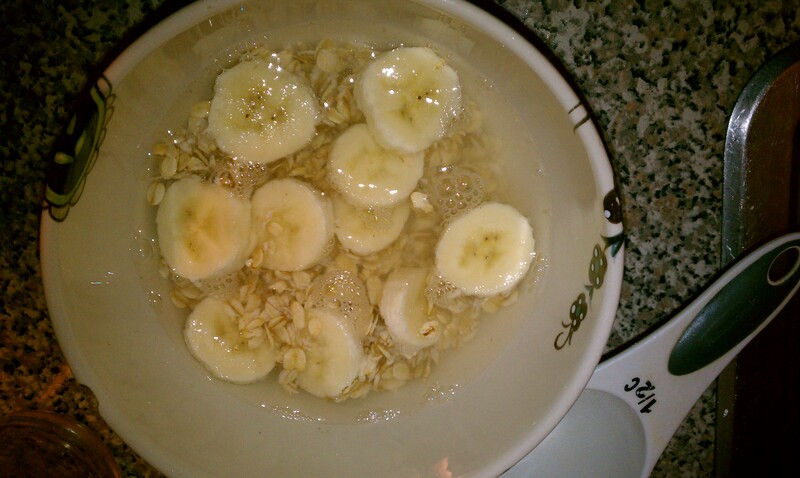 You take a half cup of oats, half of the banana, and a cup of water and put it in a bowl. It looks like this. 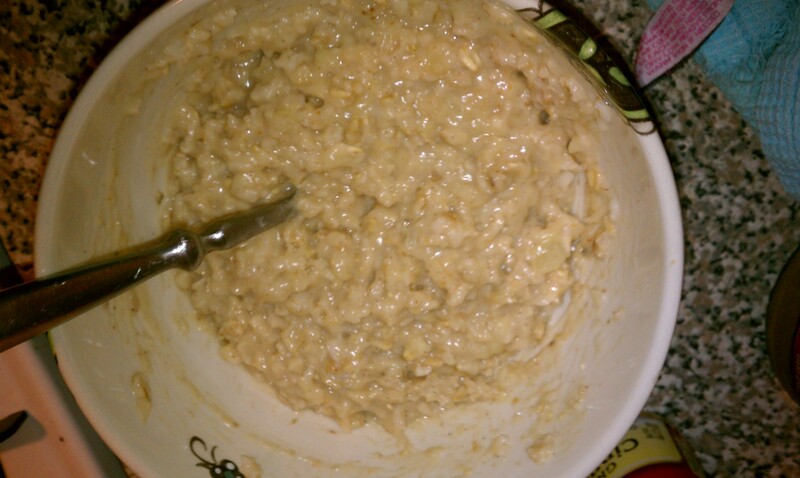 Then you throw this concoction into the microwave for 3.5 to 4 minutes. While it’s cooking, I make my coffee. Or check my email. Maybe you’re going to take a shower, feed your dog, frolick in the morning mist…Who knows. You have a max of 4 minutes. Do what you need to do in that span of time. When the glorious oats and the (kind of) glorious banana have been cooked in the wave of micro, here is your result. 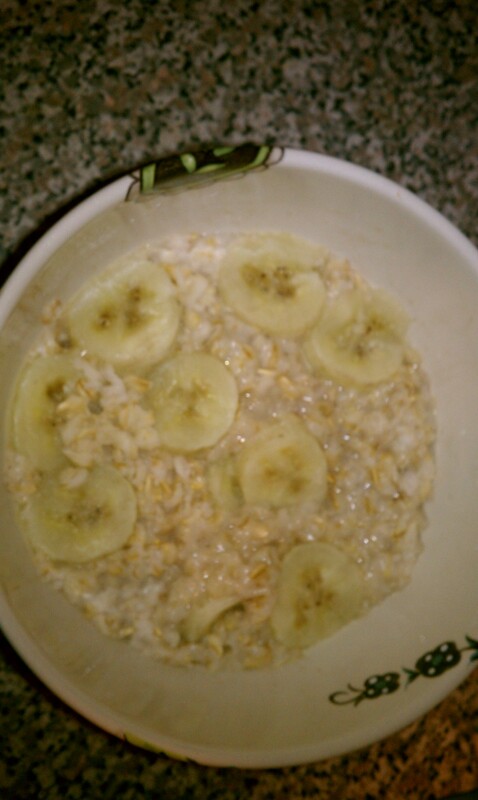 The sweetness of the banana has seeped into the oats and created more joy for your tummy (I also like to add 1 packet of splenda to increase the sweet of the meal, but you def don’t have to). Now we’re about to get crazier because you’re adding 1 tablespoon of pb and as much cinnamon as your heart desires (I chose a landing strip amount). Yesss…. Et voila. The totally gross looking amazing result mixed up. It is so delicious and healthy for you that I can barely stand it. 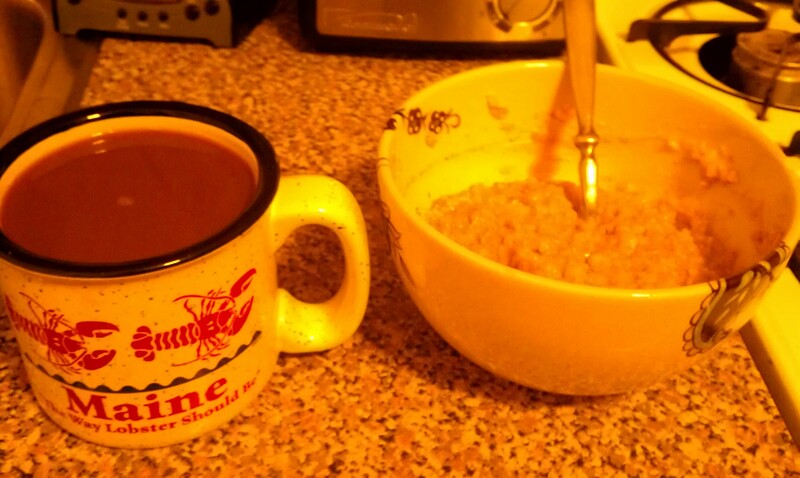 Here is my fantastic oatmeal with my favorite mug to drink coffee in. Not only is Maine “the way life should be” but it is “the way lobster should be.” Obviously. Now go and gobble this stuff up and feel the nutrition stick to your bones til lunch time when you will eat something equally as healthy and delicious. If you’re following weight watchers, this breakfast is 7 plus points. If you’re just eating healthy, well, good job. You’ve done it. This is very similar to what I eat every morning. May I suggest a substitution for your banana hating friends–a big dollop of unsweetened applesauce. You can also toss in a couple tablespoons of flax meal for health reasons. Great idea, Richard! Love it!